Industries spent millions of dollars each year on valuable industrial electrical/electronic process equipment that requires protection from the overall corrosion potential of their environment. 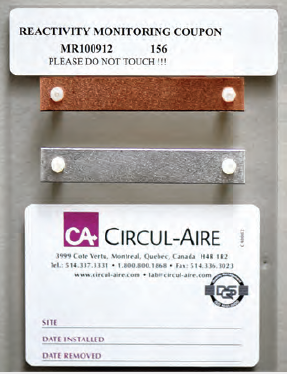 Circul-Aire’s Reactivity Monitoring Service (REMO) diagnoses the corrosion of these environments according to the instrument Society of America’s (ISA) Standard S71.04 outlining severity of corrosion from G1 (mild) to GX (severe) environments. The severity level of the environment is gauged by means of Circul-Aire’s Reactivity Monitoring Coupons installed in strategic areas for periods of 30 to 90 days. Normalized one-month value for ISA classification (copper strip).